I keep thinking that a trip to the ocean would be so lovey right now! As I write this post, it’s cold and rainy out. Oh what I would give to be at the ocean and beach right now. 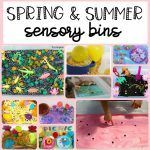 The next best thing is creating an ocean sensory bin for my little one to play with and to keep him busy! This is super simple to set up and was very fun! Put 1 cup chia seeds in the bowl. Add 4 cups of water and 10-20 drops of food coloring. Let the bowl sit for about 20 minutes to let the seeds expand. 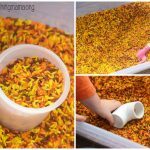 Pour the mixture into a large plastic bin. Place ocean creatures in the bin. 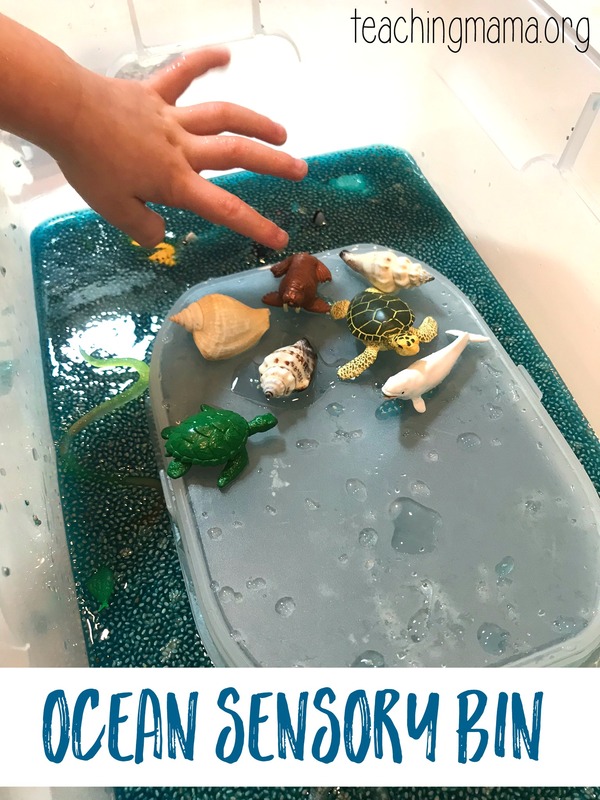 Add a plastic container (upside down) to make a place for the animals to rest. Invite your child to play! 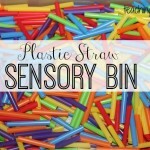 This is a sensory play activity, which means the child is using the sense of touch and sight to play with this bin. 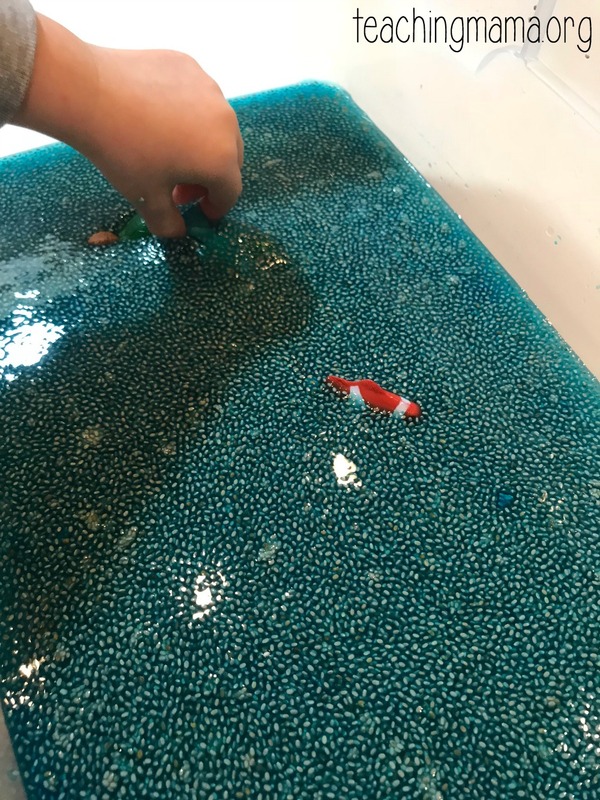 Yes, chia seeds are safe to eat, but I don’t recommend doing this while playing. 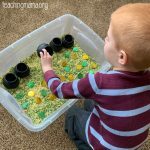 This type of activity is also great for imaginary play. Children pretend to be ocean animals. It’s even more fun if there are other children to adults to play with. The chia seeds feel so cool! They are quite calming. I do recommend having a bowl of water nearby so children can wash off their hands. 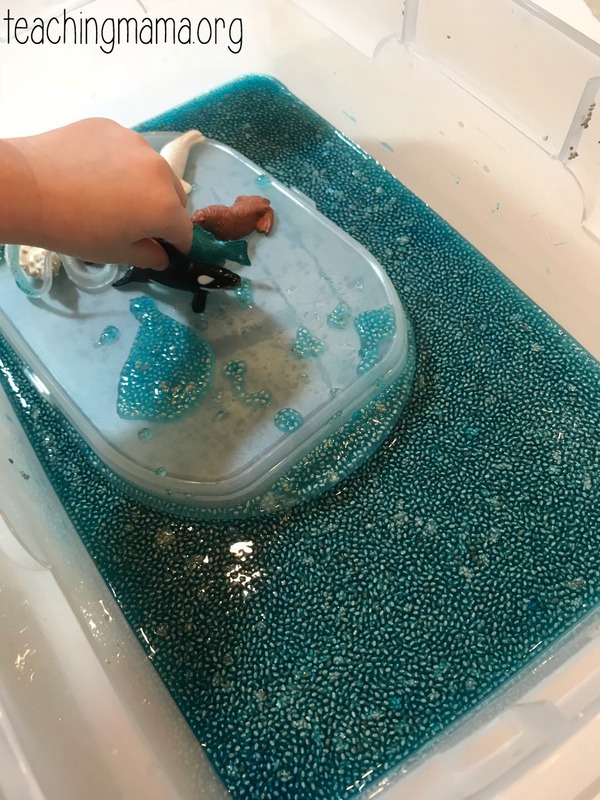 My 3-year-old doesn’t like his hands to feel dirty, so he frequently washed off his hands. Also have a towel nearby. After playing, make sure to discard the chia seeds in the trash. 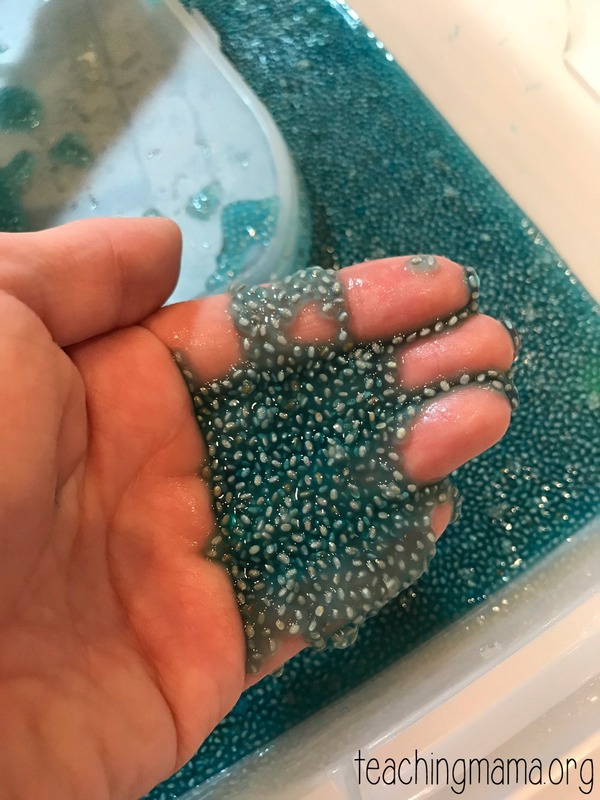 I don’t want your sinks to get clogged with chia seeds, since they do expand. As an extension to this activity, I recommend reading this lovely book! 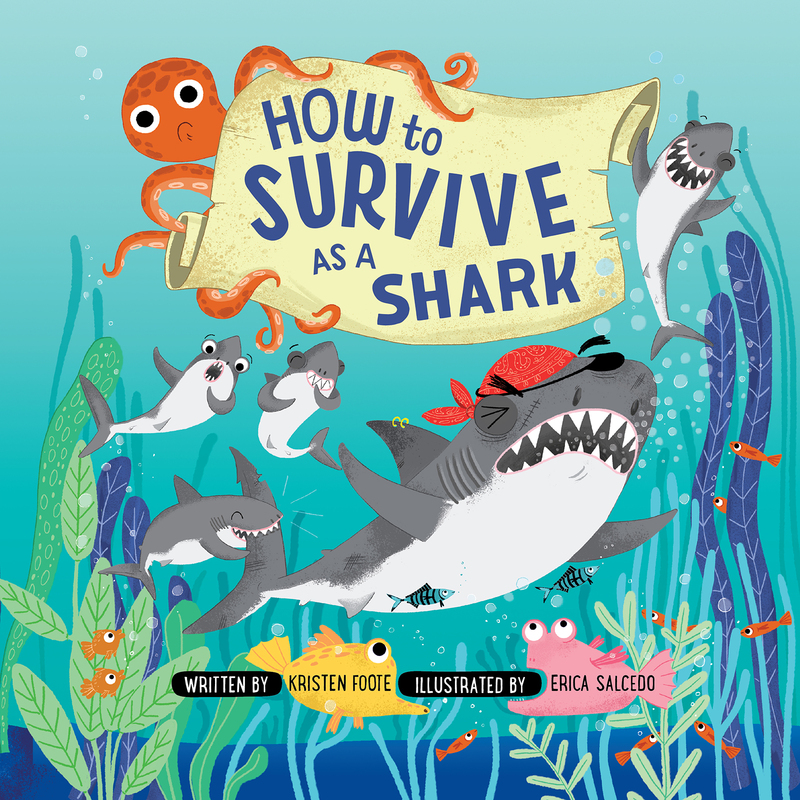 How to Survive as a Shark is an awesome book for learning about sharks, but it’s in a story format. I love the shark facts throughout the book! The pictures are beautiful and inviting for children. The book is recommended for 5-10 year olds. You can get your copy of the book here. 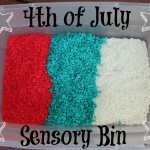 Hope you’ll try this ocean sensory bin out! P.S. 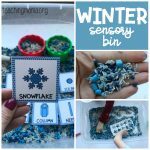 If you’re looking for more fun activities, make sure to check out my Play and Learn book! This is a hit here at our program. Only question is do you need to discard the same day or is it something that will keep for a while? Great! I only used it for one day and then tossed it. I don’t believe it would save for very long.